The KTM X-Bow GT has been launched on the China car market, priced at 1.35 million yuan or 220.000 USD. 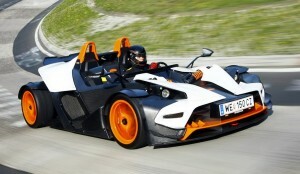 The X-Bow GT is the ‘civilized’ variant of the all-open KTM X-Bow, it comes with a windshield and a tiny bit of comfort. The X-Bow GT is street legal in China, making it one of the craziest cars in country. There may very well be super sports cars that live up to this description. Whether it be due to their spectacular appearance. Whether it be due to their outstanding technology. Whether it be due to their breathtaking performance. Or whether it be due to their history steeped in tradition. However, no other car epitomises the term “super sports car” as thoroughly and uncompromisingly as the KTM X-BOW GT. Based on the X-BOW R – itself unique in the matter of high-tech, safety, drive dynamics and appearance – Austrian manufacturer KTM has created a vehicle whose exceptional characteristics can now also be experienced without a helmet. The elegant, frameless windscreen construction, which wraps protectively around the driver and passenger in the same way as a helmet visor, allows the occupants to forego their own headgear. At the same time, however, it does nothing to impair the puristic driving experience or the radical design of the revolutionary KTM X-BOW. Quite the contrary. The evolution of the KTM design language makes bodywork elements appear more graphic, while just a few sharply drawn lines help to structure the surfaces very clearly. The engine cover, which now has gill-like ventilation slits, connects extensively with the rear bodywork elements that make the rear end – with its new shape – appear much more muscular and powerful. The view from the front also surprises with a new look: The headlamp surrounds have become narrower, the bonnets are attached over the front splitter at a striking angle – making the whole front end of the KTM X-BOW GT appear even brawnier. The new elements – windscreen and side windows – blend seamlessly into each other, thereby creating the “helmet visor effect”. The frameless upper edge ensures a flowing transition between “outside” and “inside”: It extends an imaginary line up to the rear bonnets, thereby bestowing the whole vehicle with greater dynamics. The new GT makes an even wider, lower, more compact and more powerful appearance. The fact that the aerodynamics have been improved in order to generate less drag and even more downforce goes without saying, due, if nothing else, to the racing genes that are also inherent to this KTM X-BOW. The technical basis for the KTM X-BOW GT was provided by the “R”, with its 2.0 litre TFSI power unit from engine partner Audi and a carbon monocoque found nowhere else in street-legal production vehicles. So it’s hardly surprising that numerous reminiscences of racing are also to be encountered in the interior: The fixed Recaro seat shells, which are integrated directly in the carbon monocoque and ensure excellent safety whenever its needed, in conjunction with the four-point safety belts from Schroth, are just as much part of the standard equipment on the KTM X-BOW GT as the sliding pedal box and the multi-function steering wheel with adjustable height and depth. Experience ergonomics previously unheard of in a super sports car, as the unrivalled field of view has barely changed in spite of the windscreen: The short, slender A-pillars hardly affect visibility at all; the overview is perfect, even when cornering. The KTM X-BOW GT benefits from the racing genes of the tried-and-tested model, combining them with new qualities to meet the requirements resulting from installation of a windscreen. There are many new details to discover in the interior; the centre console in particular has been completely revamped. Behind the shift lever, it’s not the ON/OFF button for starting and stopping the Audi engine that sets the tone any more, but the clearly arranged switches for windscreen wiper, screen wash/wipe system, interior ventilation/heating and the windscreen heater. A technologically sophisticated solution allows integration of particularly thin heating wires in the windscreen, which, in contrast to customary standard solutions, are barely visible even in poor light conditions.